The headline won’t shock anyone following the mobile space, although there’s more to it than meets the eye. A Distimo survey, relayed by TechCrunch, shows the Android application store rocks more free programs than Apple’s App Store. Utrecht, Netherlands-based Distimo counted 134,342 free items on Android Market versus 121,845 freebies on the App Store. 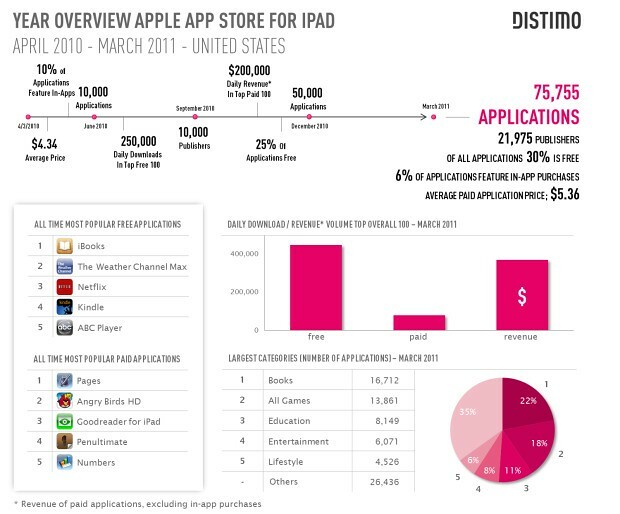 Even though Apple’s store was the slowest growing mobile bazaar in March 2011, it still leads in terms of quantity and remains the most vibrant app community on the planet. The number of App Store items is approaching the 400,000 milestone (Distimo counted 367,334 apps). At current 16 percent growth rate, however, Android Market will overtake Apple’s store in app volume five months from now. Also interesting: iPad submissions grew 12 percent in March to 75,755 apps, with an average daily revenue nearing a cool $400,000. As any iPad owner knows, a larger canvas commands premium prices ($5.36 on average for an iPad app). Another tidbit: Distimo expects BlackBerry App World to overtake Nokia’s Ovi Store by the end of next month. Some insight and more pretty charts after the break. 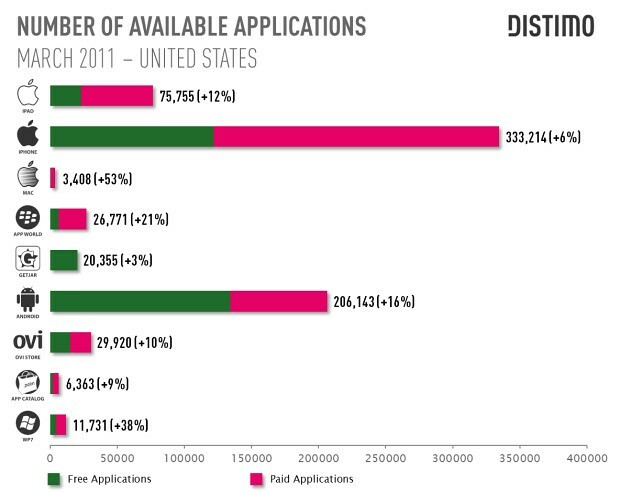 The 12,497 free apps difference in favor of Android is negligible in the greater scheme of things. Both platforms offer enough free alternatives to common apps. 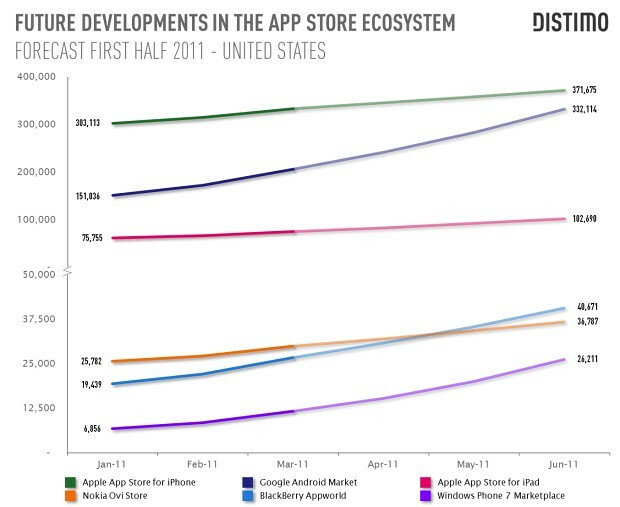 However, iOS is running circles around Android with three times higher number of paid apps. Let’s not forget iOS is the home to higher-quality software than Android. It shouldn’t surprise anyone that iPhone, iPad and iPod touch owners are spending more money on mobile apps compared to their Android-toting friends. This is especially true for premium games that are far and few between on Android. This particular category is a whole new ball game as iOS titles slowly but surely eat Nintendo’s and Sony’s breakfast. All of the aforementioned factors currently work in Apple’s favor. As of February 2011, Apple paid two billion dollars to app developers – and that’s after the company’s 30 percent cut on each sale. Poor revenue performance on Android should be blamed, in my personal opinion, to ad-supported culture, fewer triple-A games and lower software quality in general. Summing up, Android is not the home to top-notch software and there’s a survey for that, too. Android people have figured that out – hence, not a lot of them buy apps. Just my two cents. Of course, each person has his or her own pro et contra arguments so do share yours in the comments.